The reception of guests at the wedding is a detail of the attention of the bride and groom. The bride and groom select the wedding menu with special care, which will be served to guests. Details of the wedding menu are discussed for a long time with the places of weddings, Wedding cake is the most important detail of the celebration. The wedding cake must necessarily be decorated in tone with decorations. It should be decorated with artificial colors, satin ribbon in the color of wedding decorations and other cake accessories. The details of the wedding cake ceremony should be unforgettable. The cake trolley and the cake cutting knife should be decorated in tone with the wedding decor. The light should be extinguished, everything around the wedding cake should be illuminated by volcanoes, the ceremony of cutting the cake should be held under special wedding music. 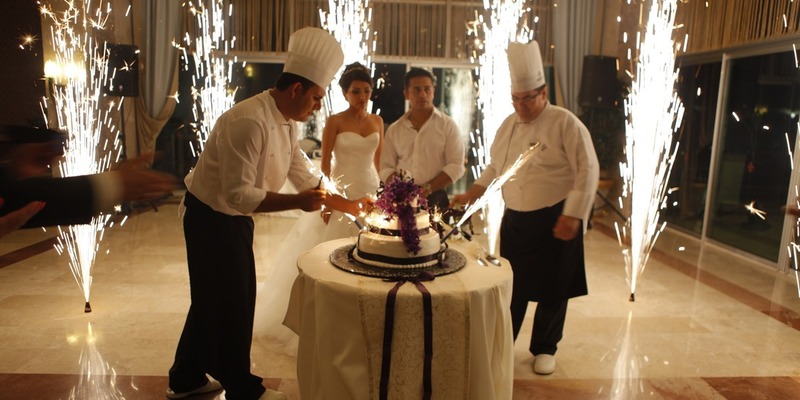 The wedding cake ceremony is a special moment for the bride and groom. After cutting the wedding cake, the couple begins dancing their first wedding dance to wedding music. The wedding cake ceremony and the first wedding dance, which are special moments for the bride and groom, are immortalized in memory with the help of wedding photos and wedding video.